A bandage dispenser that makes the nurse’s work faster and more efficient by liberating space on the medicine trolley and optimising the placement of important supplies. UP gives the carers quick, fast and reliable access to net bandaging. It combines an ergonomic design with better accessibility on the cart for fast treatment. This design also improves on traditional bandage packaging, thus giving the user a more user friendly experience. All of this was done with the goal of ensuring better efficiency while reducing the incidence of long time occupational injuries such as back pains. In this image we see a typical emergency room, the likes of which may be seen in hospitals around the world. This particular one resides in the Yuanshan branch of the Taipei Veterans Hospital in Yilan, Taiwan. As evidenced by the image, much space is taken in every level of the cart. Taking a closer look, we can see that there is one kind of supply that takes much more space than the others: The Tubular Net Bandage. This kind of bandaging is the last step in the process of treating injuries. However, the amount of space taken in the cart by it causes many problems, not the least of which is the need for constant replenishment of supplies due to the limited space. 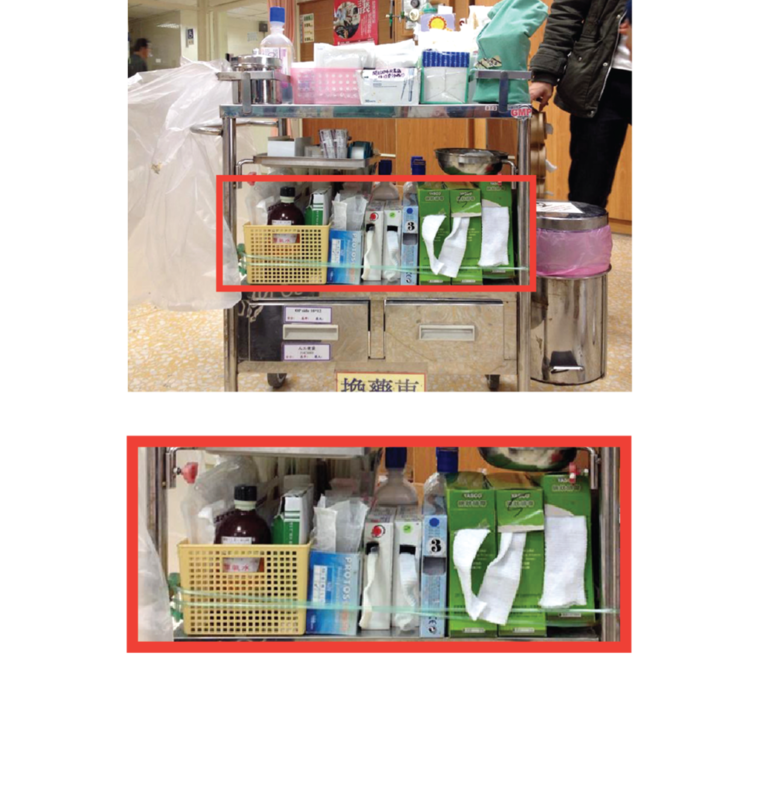 Ideally the cart should have enough supplies to last a whole week before needing to be replenished. Caretakers in emergency rooms work longer than average shifts. Most of the time they remain standing up as to respond quickly to any eventuality or emergency that may occur. The placement of the bandages makes it harder to resolve at a glance the appropriate size or number of bandaging to be used. In order to counter this, the carer usually has to take a step back from the cart to get a better look. Most bandage packaging comes in form of a square with a roll of bandage inside. Sometimes, it becomes difficult to pull due to the friction caused by tightness; especially on larger sizes. This may cause the bandaging to become stretched and therefore less effective. To facilitate visibility and efficiency, carers pull a long strip and let it dangle out of the box. This strip may become dirty when touched with the surface of the trolley or when brushed up against passerby’s legs. When the remaining length of bandage inside the box is low, the head of the bandage may drop either in or out of the box; making it hard to reach or rendering it unusable. We researched a number of possible directions for this project and ultimately decided in favor of a budget friendly device, as our directive dictated that It must be applicable to the largest number of hospitals possible. With this target in mind we then proceeded to refine the form in order to obtain a manufacturing friendly design that is easy to use, hygienic and aesthetic. Make the bandage accesible to a person of average height without bending down. About 80 cm from the ground. Make the container as visible and the sizes as discernible as possible with an angled face at 45 degrees. Make a packaging that makes efficient use of the available space found in the analyses. It needs to contain the same amount of bandage in an elongated form with less volume. Liberate space in the trolley so that supplies of first importance be more abundant and need less frequent replenishment. From two days to one full week. 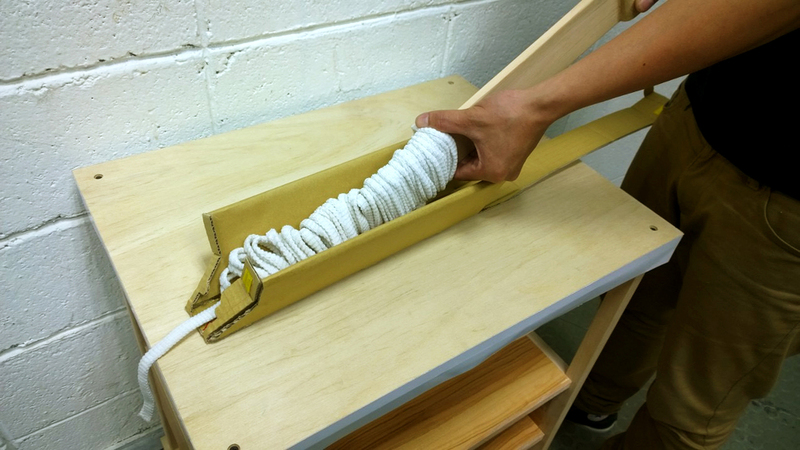 Make a groove where bandages may be fastened to avoid contamination. Enable easy access and make each size more distinguishable. During this phase we took what we learned from the previous analysis and applied it to exploring different alternatives to the final form. This exploration was accompanied by many physical prototypes in order to better understand and get a sense for how the product would work in the hands of our target demographic. The design process for this project was extremely user centric. We met with the nurses at the Veterans Hospital many times to discuss and refine our product. This kind of iteration was key for obtaining our results. We tested prototype week after week slowly perfecting the user experience. The process was so rigurous, we even wrote and published a paper on it! In the end we came up with a product that satisfied all of our design goals while also maintaining great aesthetics and high manufacturability. When the bandaging has run out, the user may slide in a new refill pack. The angled faces make the sizes easily distinguishable while standing right next to the trolley. The bandaging inside is arranged in a way that makes pulling the bandage easier than traditional packaging. A 4mm groove holds is designed to hold the bandage in place with one swift motion. While the bandage is fastened, it is easy to cut one-handed. 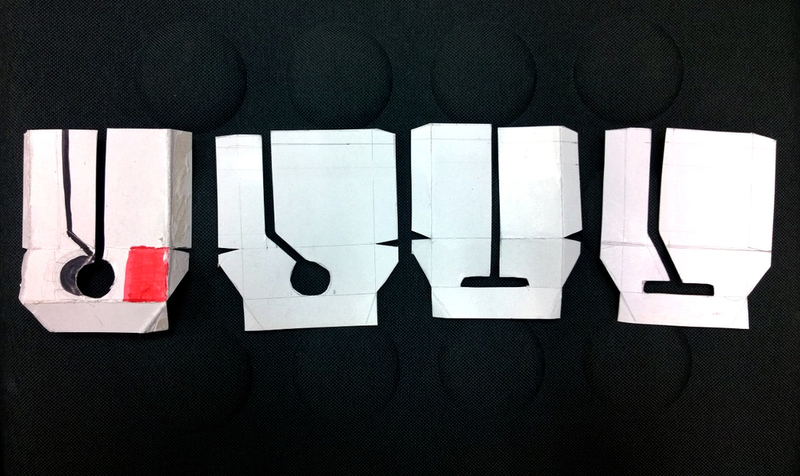 In the case that the bandage drops inside the box, we designed three angled faces for the user. These faces make the bandages easy to reach, even at odd angles. We stretched the packaging into an elongated that can be easily inserted into the container for quick refilling. We invented a new way to arrange the bandage in a way that gives a smoother pull while reducing the space footprint and minimising deformations. When it's needed, the user needs only remove the frontal cover and slide the package into the metallic container. The front of the packaging is color coordinated with the containers. 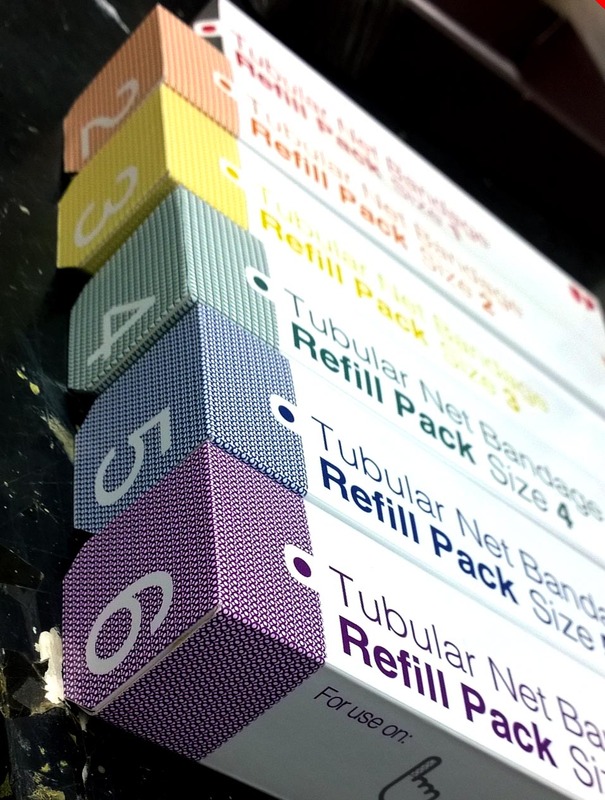 Moreover, each pack displays a pattern of the size's number; reminiscent of the woven structure of the bandaging itself.